263 Mulberry Street, Manhattan. Suggested donation: $5. By the late 1800s, Irish participation in city government and economic affairs had grown strong. This Irish influence could be seen in municipal institutions like Tammany Hall and the police and fire departments. Irish influence was also to be seen in the city’s labor movement, in the activism of revolutionary groups like Clan-na-Gael and even in efforts criticizing and opposing municipal power structures. But in 1892 explosive charges of widespread political and economic corruption rocked the city’s status quo. 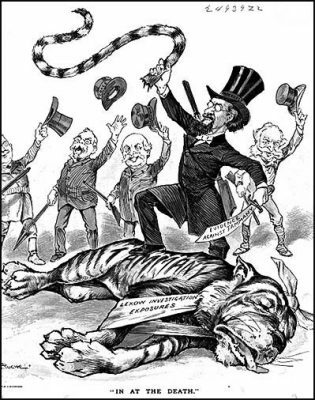 They were levelled against Tammany Hall and the police department by Presbyterian minister Dr. Charles Henry Parkhurst. As president of the city’s Society for the Prevention of Crime, Parkhurst began an unstoppable crusade against election fraud, protectionism, graft, and extortion. Two years later, his crusade forced the first sensational political investigation of the modern era and kick-started the Progressive Movement. Established by the New York State Senate, the Lexow Committee heard testimony from nearly 700 witnesses from all walks of New York life. It revealed shocking and unprecedented details—including how police managed New York’s lucrative vice economy, extorted payoffs from respectable businesses, and enjoyed immunity from charges of brutality. These and later activities emerged amidst the larger contexts of machine politics, national elections, nativism, the depression of 1893, vote fraud and suppression, police violence, and anti-urbanism. This program will feature a provocative and revealing expert talk on the issues. The diverse roles of Irish New Yorkers on all sides will get special attention. Born and raised in The Bronx, NY, Daniel Czitrom is Professor of History at Mount Holyoke College, with special interest in the history of New York City and twentieth century America. His latest book is New York Exposed: The Gilded Age Police Scandal That Launched the Progressive Era (Oxford, 2016). Czitrom’s other books include Rediscovering Jacob Riis (2008) and Media and the American Mind: From Morse to McLuhan (1982). He served as historical advisor for the BBC America historical drama Copper (2011–13) set in Civil War-era New York, and he has appeared as a featured on-camera commentator in numerous documentary film projects.